If intuition is key for instilling that elusive, magical quality into Italian food, Francesco Basile has the technique mastered. 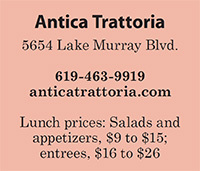 Since opening Antica Trattoria almost two decades ago, the Sicilian-born chef is known for his keen knack in allowing ingredients to spring forth equally in the dishes he sends out to an often-packed dining room. His flavors are multi-dimensional, but they’re never in conflict. And he shatters our assumption that Italian food is based on copious amounts of garlic. As any true Paesano knows, it isn’t. 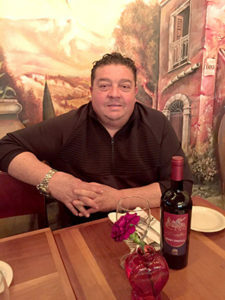 Basile’s passion-kissed meals are savored within an atmosphere flaunting large frescoes, exposed wine shelving and a cozy bar. Single bottles of vino are set on every table. And pendant lighting hangs from high ceilings, which feature rows of burlap coffee sacks hiding soundproof panels. 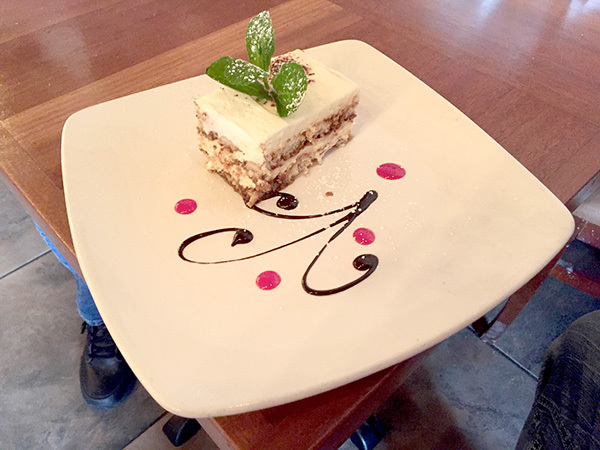 Located within a small plaza and fronted by ample parking, you’ve unmistakably entered into an established Italian restaurant that comes with a tinge of formality when passing through its threshold. The lunch and dinner menus offer the same options. Although you’ll save a couple bucks on entrees when dining in the afternoons, which might seem too early for such main courses as fettuccine with smoked salmon and shrimp in brandy cream sauce — or veal saltimbocca with prosciutto and sage browned butter. But the portions are elegantly portioned; they’re neither overwhelming or stingy. Just as I remembered when visiting twice some years ago, meals begin with warm house-made table bread and a dish of olive oil with balsamic. 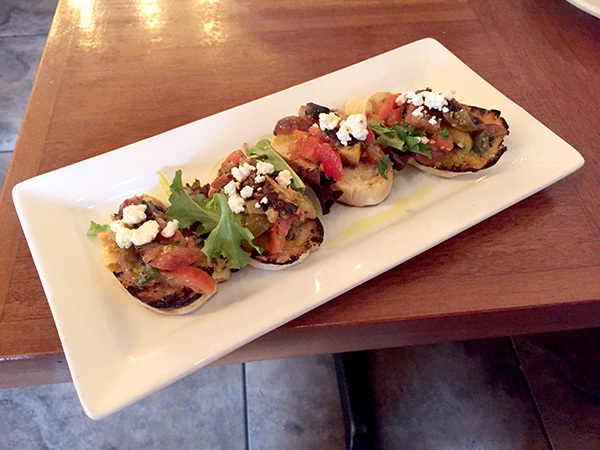 This time, instead of proceeding to my usual caprese appetizer, my lunch companion and I vouched for bruschetta that was amped up with roasted eggplant, grape tomatoes, goat cheese, basil and a hint of garlic. 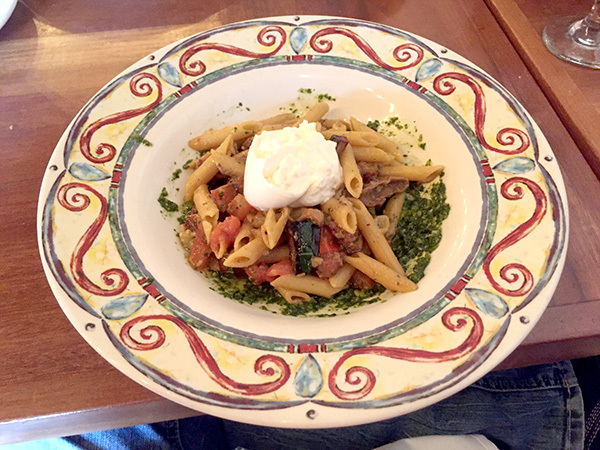 Like all of the dishes I’ve tried here, every forkful offers differing flavors and textures — always clearly Italian, but with more intriguing nuances compared to the fare at other trattorias. In another starter, for example, a quintet of small meatballs were served in marinara spiked lovingly with red wine. The sauce also gave way to pleasant bursts of saltiness from olives, which really do go well with cooked-down tomatoes. Moments of creaminess arose from a dollop of whipped ricotta on top. My friend’s house salad brought together slices of local avocados, organic spinach, and hearts of palm. It escaped coming off as “totally California” thanks to shaved Parmesan and herby balsamic vinaigrette. As for my Caesar salad, it was your everyday variety, which was exactly what I wanted. Basile makes nearly all of the pasta in-house except for penne and angel hair (capellini) cuts. But he does wonders with those, as we discovered in our entree choices. The penne was tossed with porcini mushrooms, roasted eggplant and fresh tomatoes. Depending where our forks wandered within the dish, we alternately hit upon earthiness from the mushrooms, sweetness from the caramelized eggplant, and faint garlicky spots from lurking pesto. 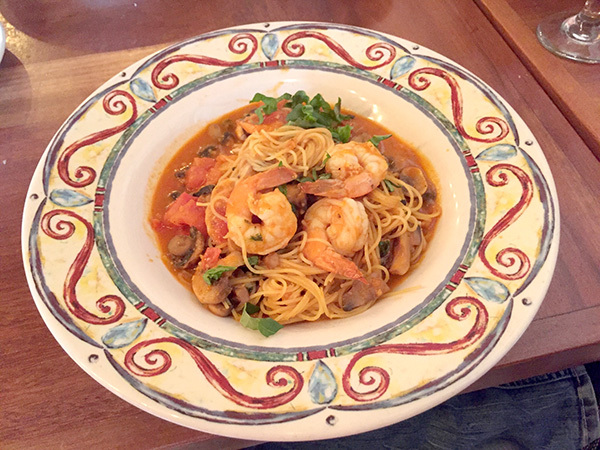 Equally exquisite was the capellini pasta strewn with white shrimp and wild mushrooms. The harmonious interplay of oceanic and earthy flavors was almost sedating. Served in thin lobster broth accented by chardonnay wine, the dish is almost French in nature except for the lack of cream. Even when eating the leftovers at home a few hours later, there was enough liquid in the dish to keep everything juicy. Basile changes the menu seasonally, sometimes making only subtle changes to existing dishes. But the two untouchables, he noted, are the calamari steak with shrimp and lemon-butter sauce, and the boneless Angus short ribs (brasato), which he serves in robust cabernet sauce with fresh vegetables and mashed potatoes. From a small selection of house-made desserts, we vouched for a boozy version of tiramisu as well as a puck of warm, comforting chocolate lava cake. Both of the semi-sweet confections, along with everything else I’ve ever eaten here, brim reliably with heart and soul.